Follow these steps to program debugging using the µVision Debugger and the ULINK USB-JTAG Adapter. Detailed information can be found in the µVision User's Guide in the Creating Applications chapter. Connect the ULINK to the JTAG connector of the MCBXC866 Board. Note that the red cable marks pin 1 of the JTAG-connector. Make sure that the jumper J6 (BSL) is OFF. Configure the Debugger in the Project - Options for Target - Debug dialog. 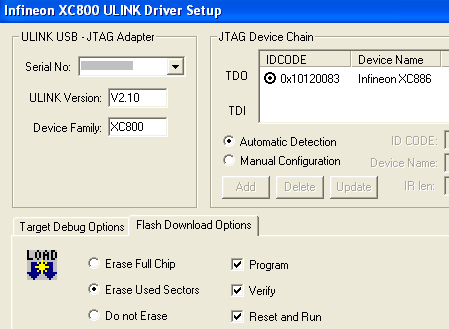 Select the Use Target Driver for Flash Programming radio button, then select Infineon XC800 ULINK Driver from the drop-down list to debug via the ULINK USB-JTAG Adapter. Check the Load Application at Startup and the Run to main() options. This loads your application and executes code up to the start of your main() function when the debugger starts. Click the Settings button to open the Infineon XC800 ULINK Drive dialog. This dialog displays the IDCODE of the XC800 device on the MCBXC8xx Board. Select the Verify option under Flash Download Options to compare the loaded application program with the Flash ROM content. Disabling this option reduces the time it takes to start the debugger. Use the Start/Stop Debug Session toolbar button to start debugging the program. Use the µVision command, Debug - Start/Stop Debug Session, to start debugging the program.